Images are to Vevey, what jazz is to Montreux and classical music is to Lucerne. Kicking off on 11 September, Images ’08 will again celebrate Vevey’s pivotal role in photography and the visual arts. But when in Vevey, you won’t need to go to this year’s biennale, it will come to you. The entire city landscape will be spiked with dreamy images and inspiring events in an art free-for-all that takes place over 20 days until 30 September. Branded “City of Images”, Vevey is home to a photography school and a camera museum, as well as the Swiss National Centre of Drawings – which now extends to cartoons and comic strips – at the Jenisch Museum. To anchor its reputation in this field, Vevey launched the Images festival in 1995, but recent editions attracted mainly the cognescenti. Now, Stefano Stoll, the city’s cultural delegate and festival director, wants “art to be at the heart of everyday life” and to come to us. He has chosen a theme for this year’s edition that is clearly designed to put us in(side) the picture. A play on the word “Scale”- as in models, in life, in relationships and in movement – is the driving idea behind the festival. 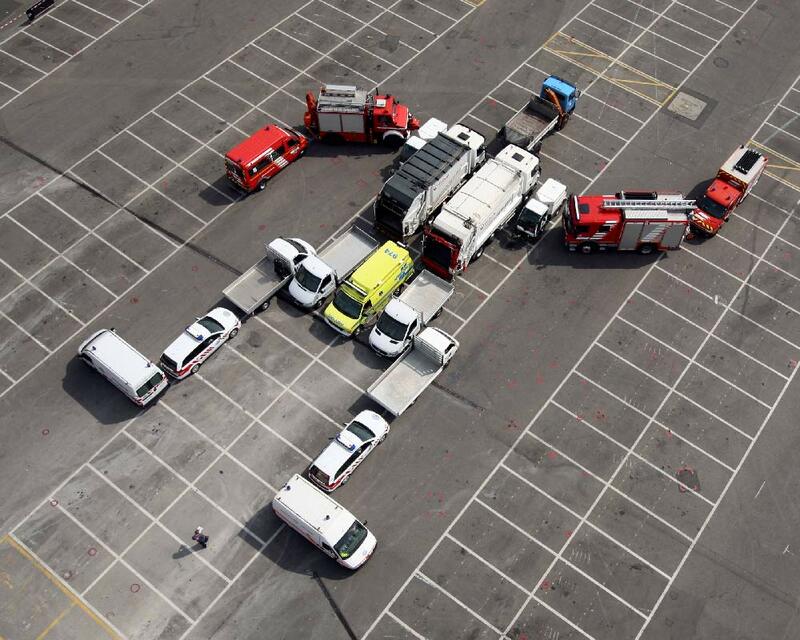 A teaser took place on 26th August, when Guillaume Reymond of You Tube fame – his Tetris has now been viewed over 12 million times since it won the 2007 You Tube Creativity Awards – engineered a monumental Spielberg look-alike Transformer on Vevey’s main square. Seen at ground level, the fleet of the commune’s utility vehicles looked like they were lining up for a crooked parade. But as filmed from a zeppelin above, the orchestration suddenly made visual sense as a Transformer emerged from the frozen motorcade. The festival takes place all over Vevey, with several happenings programmed on the first weekend. The exhibitions, inside and outdoors, last for the duration of the festival. The outdoor exhibitions, dotted around the city, present large-scaled images by more than 20 photographers, some of world fame. Julia Fullerton-Batten’s silent teenage girls in gleaming undersized decors still adorn the Teen City poster for the current (and unrelated) exhibition at the Elysée Museum in Lausanne. The British artist is raking in international prizes for her exquisite and telling compositions. 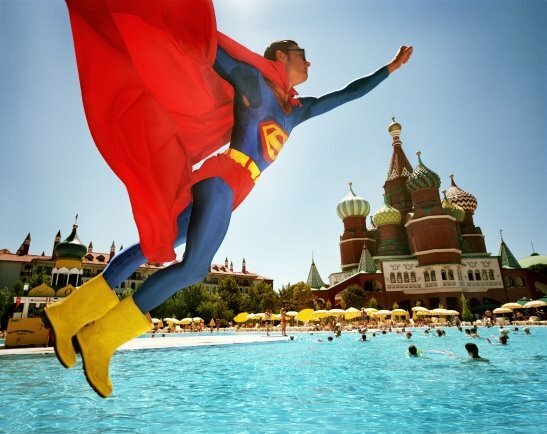 Reiner Riedler’s Artificial Holidays has Superman flying past the Kremlin and an indoor skiing hall in Dubai. Defeating gravity, Denis Darzacq’s Icaruses tend to fall sideways or upwards, whereas Vincent Fournier‘s astronaut appears to be inconveniently glued to flock wallpaper. There is an element of pathos and comicality in all these pictures. The same cannot be said of two major American artists whose works are prominently featured. Chris Jordan, a lawyer by trade, transforms the horrors of mass consumption into patterns of obsessive beauty. His spent bullet casings and discarded mobile phones, in Jackson-Pollock-like scatterings, will be visible at the Vevey train station, but take a look on his web site at the worrying constellations of Barbies and serpents of disposable plastic cups. 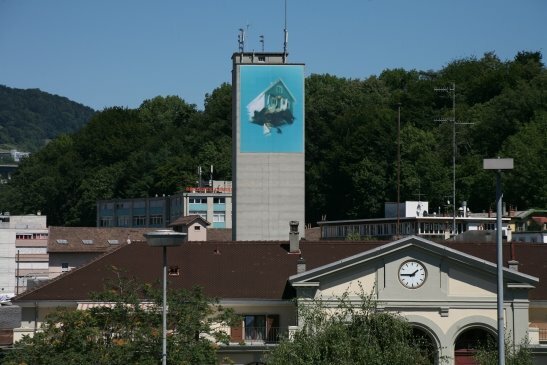 In an ominous foretelling to the subprime crisis, Peter Garfield’s flying mobile homes, about to crash and disintegrate, appear in monumental form on the side of a silo in Vevey that will soon also disappear. In addition, a solo exhibition is fittingly, and humorously, housed under the Medeival gables of the Musée Historique de Vevey. Gilbert Garcin at the Galerie Clément is another must. A Magritte-like figure stands in dull poses in enigmatic matchbox environments that look like they will shatter at the slightest move. Garcin is an 80 year-old former lampshade factory director whose retirement has become a shop floor for creativity. Images ’08 naturally includes a film program at the Rex Cinema that is celebrating its 75th birthday. With a tribute to funny films, including by Vevey’s most famous former inhabitant, as well as pictures that feature photographers as their heroes, the shows at the Rex will be the only part of the festival with an entrance fee (CHF 10). Last but not least, international contests crown the laureates of the European Grand Prix of First Films , as well as the Vevey International Grand Prix of Photography. Stoll is a proponent of creative art and intelligent patronage. He belongs to a rare breed of cultural managers who not only speaks, but acts. He recently caused a stir by responding indignantly to declarations of negative fatalism proffered by the Director of Pro Helvetia, the equivalent of the Arts Council. The ensuing cultural debate seems to have sent the wheels into gear, especially at federal level. The urban branding of Vevey as “A city of images” preceded him, but Stoll has given it greater relevance, including by positioning Vevey as a film location paradise. This year’s edition of Images ’08 is meant to seduce and will no doubt prove that art can be popular, unpretentious, fun and enlightening.